Each County in California issues Public and Confidential Marriage Licenses however, each County may have different rules on how to obtain. Please check with your local California County Clerk for this information. As a courtesy, Southern California County Clerk websites are linked below. If your County is not listed, simply search for “County Clerk of (Name of County)” for more information. CLICK HERE to read this policy. This website is for designed for information purposes only to help couples planning their wedding at Cuvier Park, La Jolla. TheWeddingBowl.com (Vows From The Heart Ministries) is not affiliated with the City of San Diego or the Shoreline Parks Department. 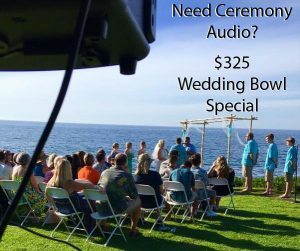 TheWeddingBowl.com is not affiliated with the City of San Diego or Shoreline Parks Department.